Why Do Juventus Fail in the Champions League Despite Dominating Serie A? In Athens, a familiar story unfolded. Arriving as favourites for their Champions League game against Olympiakos on Wednesday night, Juventus started slowly, gave up a goal, woke up too late and were then thwarted by a combination of poor finishing and an inspired goalkeeper. To put it another way, they did exactly the same thing as they had against Copenhagen last season, and Nordsjaelland the year before that. The only difference this time was that they wound up losing instead of scrabbling their way to a draw. The intention here is not to take anything away from Olympiakos—a distinctly more talented group than either of those two Scandinavian sides—but simply to highlight the recurrent nature of the Italian champions’ woes. Juventus’ recent away record in the Champions League is atrocious. Since beating Celtic in Glasgow two seasons ago, they have drawn one and lost five of their six away games in the competition. While their home performances have also been imperfect, they have lost just one Champions League game at Juventus Stadium over the same period—and that against a Bayern Munich team that was on course to win the whole tournament in 2013. Clearly, Juventus' results away from home are preventing them from fulfilling their potential in Europe. So how should we explain such consistent underachievement? Bayern Munich’s CEO, Karl-Heinz Rummenigge, offered one possible explanation. He was quoted by the newspaper Gazzetta dello Sport (in Italian) on Thursday as saying that Serie A clubs were not used to the high tempo at which other European clubs play the game. His assertion is borne out, to some extent, by the numbers. Between the two Italian clubs competing in this season's Champions League, no player has run more than Stephan Lichtsteiner, who has covered 32,626 metres in three games. But this ranks him just 66th overall among all players in the competition, according to Uefa.com. And yet, it is too simplistic to explain Juventus’ problems thus. While Rummenigge’s comment might have been influenced by Bayern’s 7-1 rout of Roma at the Stadio Olimpico on Tuesday, we should not forget that the same Giallorossi team had set the tempo for long stretches against Premier League champions Manchester City at the Etihad barely three weeks earlier. The same could be said of Napoli’s wins against Borussia Dortmund, Arsenal and Marseille last season, or at home against City and Chelsea two years prior to that. Demonstrably, with the right approach, it is still possible for the Italy’s best teams to impose themselves in European games, in a way that Juventus have repeatedly failed to do. So what are they getting wrong? Many have argued that Juventus’s problem is simply one of tactics. When Antonio Conte first took over at the club in 2011, he experimented with a 4-2-4 formation that had served him well at Siena. Very quickly, though, he concluded that this shape did not suit his personnel, instead devising a 3-5-2 to take advantage of his abundance of central midfielders. Domestically, it was a huge success, that formation granted Andrea Pirlo space to pull the strings while Arturo Vidal and Claudio Marchisio put in the hard graft alongside him. But in Europe, where opposing teams have done a better job of restricting Pirlo, the same tactics have been far less effective. 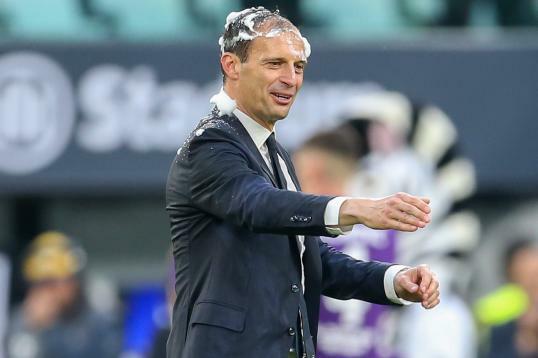 Conte’s successor, Massimiliano Allegri, has continued with the 3-5-2 so far this season, but it was noteworthy that Juventus only began their fightback against Olympiakos after he switched to a 4-2-3-1 in the second half. Other teams have demonstrated that a three-man defence can prosper in Europe, but the issue is one of interpretation. Napoli used a 3-4-2-1 to great effect under Walter Mazzarri in 2011-12, because they were happy to sit back and absorb pressure before breaking at speed with three exceptional, jet-heeled, forwards in Ezequiel Lavezzi, Marek Hamsik and Edinson Cavani. Likewise, Bayern have been devastating in a 3-5-2 under Pep Guardiola this year, but they are interpreting the scheme in a manner unlike anything we have seen before—shifting fluidly between different shapes throughout the game. Tactics writer Michael Cox, of zonalmarking.net, defined their formation as “indescribable”. Juventus, by contrast, have been all-too predictable. To some extent, that is a question of personnel. Lichtsteiner, for example, is a solid contributor, but he could hardly match the attacking contributions of his Bayern counterpart, Arjen Robben. The Bianconeri have bigger problems up front. Carlos Tevez was a stunningly good signing at just €9 million plus bonuses, per the Guardian, last summer, but his difficulties scoring in Europe go back as far as 2009, and they have not been wiped away by two goals this season against Malmo. Fernando Llorente is struggling alongside him, and Alvaro Morata, while certainly talented, remains inexperienced on this stage. The easy response here is to simply point to the club’s budget. Despite recent growth, Juventus’s overall income is still dwarfed by that of the biggest clubs in England, Spain and Germany. They placed ninth in Deloitte’s Money League for 2014, with revenues of €272.4 million, as compared to €518.9 million for first-placed Real Madrid. But while nobody is expecting Juventus to win the Champions League as things stand, consistently competing for a place in the quarter-finals ought to be a realistic goal. What fans are asking today is not why the club cannot beat Madrid or Bayern Munich, but simply why they cannot win away to the likes of Olympiakos, Copenhagen and Nordsjaelland—clubs that do not appear in Deloitte’s top 20. Perhaps the real answer is not one of tactics, or playing staff, at all, but simply one of approach. The truth is that domestically, Juventus are used to rolling over their opponents—too many of whom approach matches against the champions with cautious, defensive game plans based entirely around self-preservation. When teams break out of that mode, even in Italy, the Bianconeri can sometimes be caught off guard. Four days before the loss to Olympiakos, Juventus travelled to last-placed Sassuolo expecting an easy win. Instead the Neroverdi refused to be cowed, attacking their opponents with rare abandon, and they came away with a deserved 1-1 draw. It is a model that other clubs in the lower-half of Serie A would do well to observe. And it is a lesson that Juventus would do well to learn. Their best European performance of the last two seasons came against Real Madrid, where they lost narrowly last season after a harsh red card to Giorgio Chiellini. Knowing that they were facing one of the best clubs in the world, the Bianconeri raised their tempo from the outset, instead of waiting until they had fallen behind. If they could bring the same gusto to the first-halves of their matches against Europe's lesser lights, they might not find themselves in the position that they do now. Juventus need to be much better in their remaining fixtures if they are to make it through to the last 16. The only good news is that two of the three are at home.